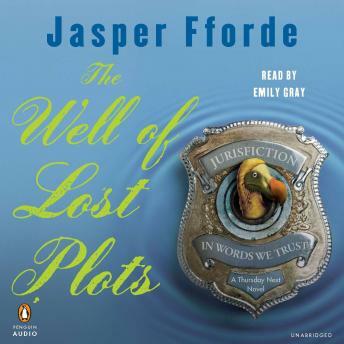 asper Fforde has done it again in this genre-bending blend of crime fiction, fantasy, and top-drawer literary entertainment. After two rollicking New York Times bestselling adventures through Western literature, resourceful literary detective Thursday Next definitely needs some downtime. And what better place for a respite than in the hidden depths of the Well of Lost Plots, where all unpublished books reside? But peace and quiet remain elusive for Thursday, who soon discovers that the Well is a veritable linguistic free-for-all, where grammasites run rampant, plot devices are hawked on the black market, and lousy booksâ€”like the one she has taken up residence inâ€”are scrapped for salvage. To make matters worse, a murderer is stalking the personnel of Jurisfiction and itâ€™s up to Thursday to save the day. A brilliant feat of literary showmanship filled with wit, fantasy, and effervescent originality, this Ffordian tour de force is the most exciting Thursday Next adventure yet.